Blog > Yes, we’re quite jolly. The year end often comes with a bit of a sting. All year, the staff works tirelessly to produce an event like nothing else in the world. To do so, we have a full time, year-round staff of 12, an amazing part-time and contracted staff and a seasonal force of 15-20 people. There are many reasons to work at ArtPrize, reasons that outweigh the long hours and the annual departure from friends and family from August to October. One of the best reasons to work here is the people. Nobody gets into the non-profit arts world for the paycheck. It's a calling. It's a deep sense that Art, creativity, innovation and community can change the world. Working at ArtPrize gives you a front row seat to see the work of budding artists, novices and hobbiests alongside the work of true masters of contemporary Art. While this mash-up can at times be overwhelming, the tension it brings also springs hope through unexpected connections and community. From these moments we grow, and experiencing these moments on an ArtPrize scale bonds the entire staff in a really wonderful way. The year-end sting comes from seeing our seasonal staff move on. It is a true priviladge to work with such an exceptionally competent group with a passion for our community. Most are quickly picked up by some of the best organizations in West Michigan, and many will be working with ArtPrize in new roles with partners across the state. Back at the ArtPrize offices, we clean up, inventory, audit and plan, plan, plan. Yes, it is hard to see the magic of the ArtPrize event go just as quickly as it came, but the 2014 plans are well underway and we have some really exciting news to announce in the first quarter. ArtPrize 2014 will be an amazing ride. For that, and for what came before, I am jolly. 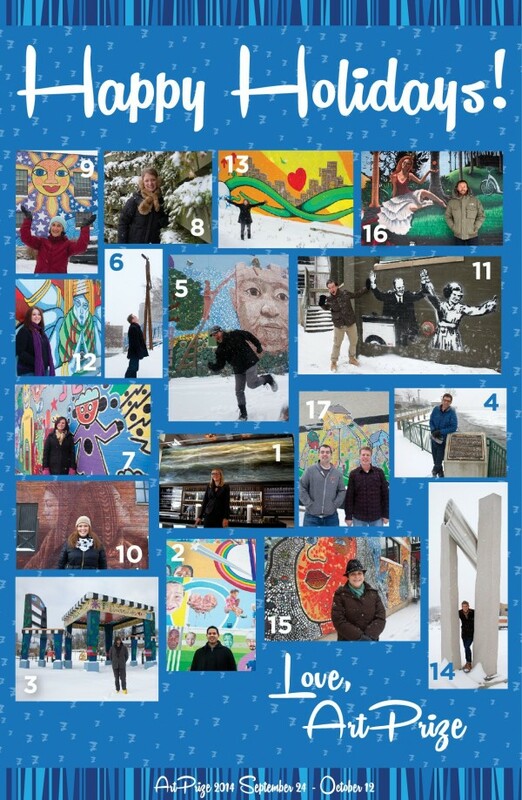 The holiday card below shows 18 of our full-time, part-time and contracted staff (oh yeah, and one board member). Each are shown alongside 17 works of art that were entries across all five years of ArtPrize, and remain on public display in our great City. We hope you will take a little holiday trip and visit them all.